Thanks Tammy! Just placed my order – can’t wait to get all the goodies! I was thinking of Motor last night and how his suggestions will be so helpful for you at this stage. I think you will love it! Thanks Tammy! What A Great Deal! It is truly worth about a million times more than the cost. I know you will love it! It’s an amazing book Tammy! 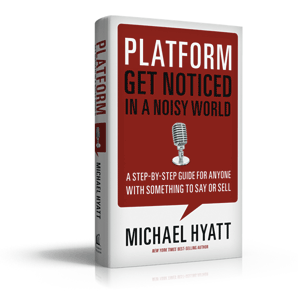 I really enjoyed reading my copy and think it will help me take my blog to the next level. Hope it will do the same for you. Ordered it this morning…AND Blue Like Jazz! Awesome! You will love both. Love Does is another one I think you will like. Really powerful. I have to check out Love Does. It is so good! Life changing. You won’t be disappointed with those choices Angela. Platform is great. Blue Like Jazz is eye opening. Wonderful post Tammy! Platform is great! !